The Federal Managers Association (FMA) is the oldest, largest, and most influential association representing the interests of the 200,000 managers, supervisors and executives serving in today’s federal government. Since 1913, FMA has been a passionate advocate for excellence in Federal public service through effective management and professionalism, as well as a forceful champion of its members’ legislative agenda. FMA’s team of advocates, policy analysts and communications specialists leads this effort. FMA Chapter 19 was founded in 1946. From our most humble beginning within Pearl Harbor Naval Shipyard and the Department of the Navy, our membership has expanded and now includes commands and activities surrounding the Pearl Harbor basin. FMA Chapter 19 effectively brings Federal workforce concerns on job, career, salary and benefits, retirement security and other issues to the attention of lawmakers and top agency decision makers. Eligibility for regular membership extends to persons responsible for or associated with the management and supervision of people, programs and resources. FMA offers several membership categories including regular chapter members, members at-large, associate members, and retired member, and lifetime retired members. Our membership spans GS/GM ranks, the Federal Wage System, and the Senior Executive Service. 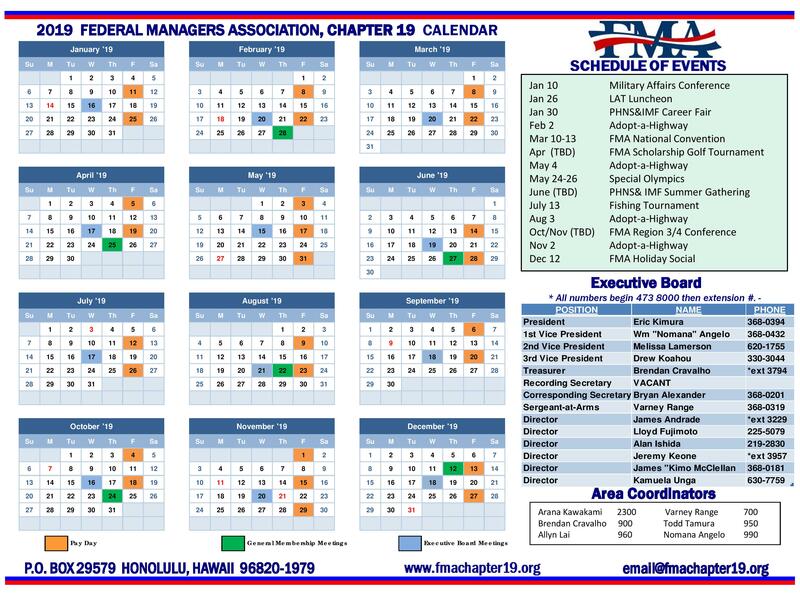 Contact FMA Chapter 19 for more information on the different membership categories.